Chemical peels and lasers are outpatient methods of exfoliation or peeling the layers off the skin. Each procedure offers a variety of levels to determine how deep the exfoliation goes. Exfoliation is used to improve the skin texture, reduce wrinkles, acne scars and other blemishes. Both treatment methods give the patient’s skin a refreshed appearance, correct skin discolouration and minimize scarring. While chemical peels are faster and cheaper, laser treatments must be repeated every 4 weeks for up to several months in order to maintain the achieved results. Another big difference between the two is the technique and technology involved. One must look into both treatments before finally deciding on the right one. Laser treatments, also known as laser peels, are for those looking to remove blotches, scars, wrinkles and acne scars. The process includes precisely removing skin layer by layer to reveal the new skin cells that form a brighter, younger and tighter surface. The procedure can be done both alone and as a complementary procedure to other cosmetic surgeries. A full-face treatment can take up to 2 hours and requires both topical anaesthesia and a rather tedious home care routine that lasts for a week. Chemical peels have no specific duration but can take between 10 minutes and 2 hours, depending on the treatment being done. The process involves removing the dead skin responsible for the dull appearance of the skin. There are two kinds of peels; light and deep. Light peels involve having the chemical solution on the skin for up to 10 minutes. Deep peels are more intense, involving chemicals that stay on the skin for up to 2 hours. After the chemicals are removed, a thick and heavy coat of moisturizer is applied to the face and left on for 2 days so as to treat the sensitive new skin. This results in an instantly noticeable and brilliant glow. For the procedure of laser skin resurfacing, the “Mixto SX” Micro Fractional CO2 laser is used. It is one of the most advanced lasers out there. It ablates the dermis to cause immediate skin contraction and tightening which will then encourage the production of new collagen. The duration of the procedure depends on the size of the area being treated, but it should not take more than an hour. Recovery is about 5 days long with no sun exposure and once the 5 days are over, you are free to apply makeup to conceal any remaining redness. For the chemical peels, there are 3 varying degrees; light, moderate and deep. Each peel has a certain strength that allows it to remove certain layers of skin. This treatment takes approximately an hour to complete and the time needed for recovery depends on the peel that was used. A deep peel requires you to stay out of the sun for several days while a light peel often needs no downtime at all. 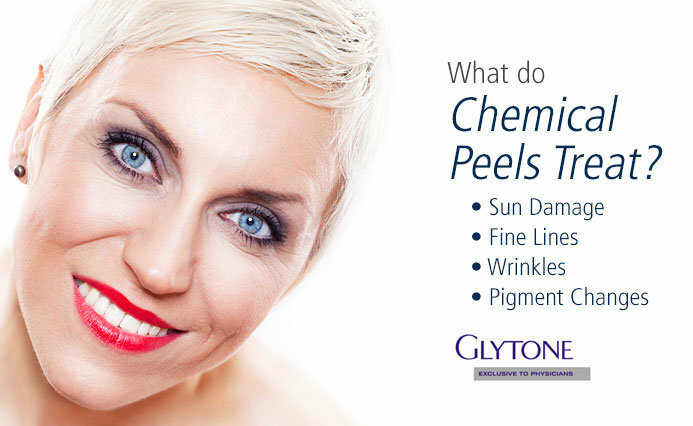 Chemical peels are made from a combination of chemical solutions. Those solutions are phenol, trichloroacetic acid and alpha hydroxy acids and they’re applied directly to the skin with the intention of removing its outer layers. For light chemical peels, the face is cleansed, the solution is then brushed onto the skin and left for up to 10 minutes. The solution is then washed off and neutralized. For deep chemical peels, Retin A is used to thin out the skin’s surface layer. A sedative and a local anaesthetic are given then the chemical peel is applied where it stays on for up to 2 hours. Afterward, a heavy coat of petroleum jelly is applied and must be kept on for up to 2 days. 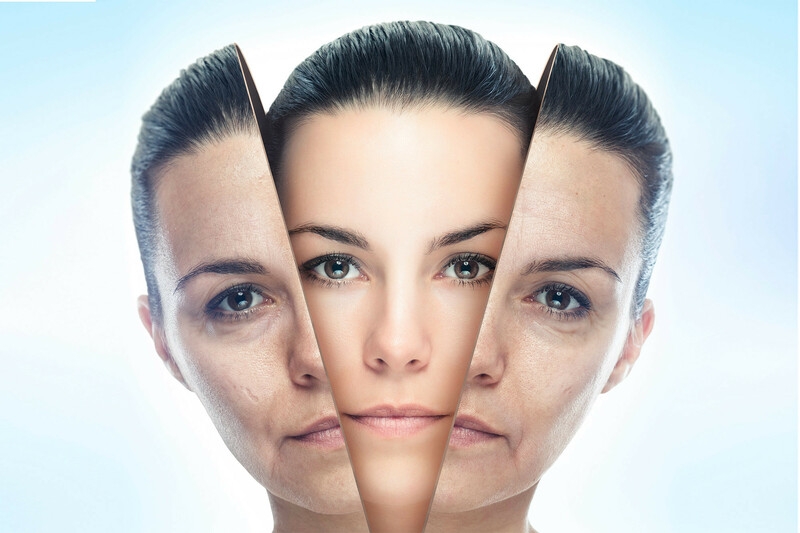 Laser skin resurfacing removes the damaged skin layer by layer. This is an outpatient procedure that can take between 30 minutes and 2 hours. The skin is numbed with local anaesthesia, the face is cleaned then the lasers are activated to remove the layers of skin. The practitioner will apply a dressing afterwards. The average price of a chemical peel is between $80 and $160 per treatment. There is a range of a stronger peel would typically cost more. The average price of a skin resurfacing treatment session is between $1500 and $3000 for treatment of the whole face. 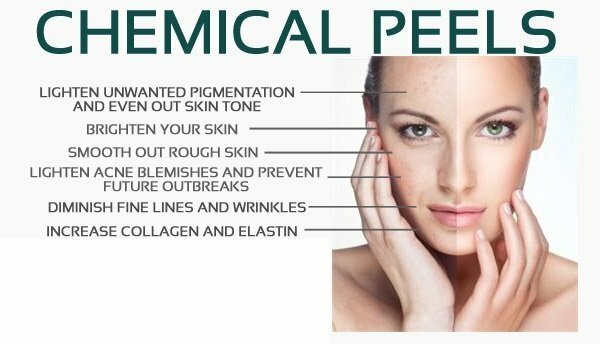 Chemical peels are often used to correct acne, fine wrinkles, sun exposure, irregular textures, freckles as well as blemishes. The lasers used in skin resurfacing correct scars, reduce wrinkles as well as improve the skin’s tone and texture through the removal of the skin’s top layer. The effects of a chemical peel can last for years, depending on the strength of the peel used and if there was good protection from the sun involved. However, factors such as acne breakouts and hormonal changes can cause changes in the pigment or even cause new scarring. The effects of laser resurfacing can also last years, also with the help of proper protection from the sun. However, as this procedure does not give permanent results, the skin will age and exposure to sun can reverse the results provided. Medium chemical peels may cause a burning or stinging sensation, or turn the skin red or brown for a couple of days. It can take up to 6 weeks for the skin to return to normal. Deep chemical peels will definitely involve peeling, redness and discomfort for several days that immediately follow the procedure. This can remain for up to 3 months. Laser resurfacing can cause swelling, redness, potential itching or stinging for the first few days after the procedure. The skin may look like it has a sunburn with blisters that ooze. For the first week after the treatment, the skin will peel. Some complications that may be experienced include bacterial infection, cold sores, hyperpigmentation, acne flares, scarring and swelling. Those who had undergone laser resurfacing or a deep chemical peel have revealed that they received dramatic results and were very happy with the outcome. Laser resurfacing has the benefit of continuous improvement over the next few months due to the stimulated production of collagen within the skin. Light and medium chemical peels also provide great results but require subsequent treatments to maintain or completely rid the skin of some imperfections. Those who had undergone deep chemical peels cannot return to work immediately or apply products to their face for the 2 weeks that immediately follow the treatment. Those who suffer from active acne, deep wrinkles, sagging skin or have very dark skin are not advised to undergo laser resurfacing. Both procedures have their pros and cons so it is important to do your research or book a consultation session so that you can determine the best procedure to give you your desired results.